Combined with a micro pulley it makes a great one handed adjustable lanyard friction hitch. Very importantly make sure that the friction hitch cord is suitable for the job. The Distel can also be used as main climbing line friction hitch. The friction hitch cord shown here has a scaffold knot in each end for attachment to the karabiner. 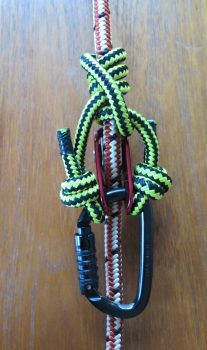 Alternatively use friction hitch cordage that has stitched or spliced eyes for a nice tidy finish. Adjust the amount of wraps to accommodate hitch cord length and the amount of friction you prefer. There’s no need to hit the volume as this video has no sound.